Okay Kids−Always Tell Your Mother Where You Are Going! Here’s an example of what happens when a seasoned director; Academy Award winner Danny Boyle (“Slumdog Millionaire” 2008) meets up with a riveting and not to mention horrifying true story in the creation of a film that is a must see. If superb acting, directing, high drama, visual effects and amazing camera angels are your thing, then you’re in for a cinematic treat. 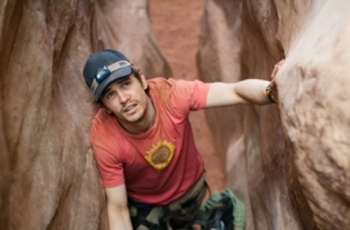 Boyle has mastered his skills as a filmmaker with “127 Hours.” Simply sit back and prepared to be wowed from the get go. The film is based on the book, “Between a Rock and a Hard Place” written by Aron Ralston, a mountain climber, played by (James Franco). He ventures out on a journey that changes his life forever. Ralston falls and a boulder crashes on his arm, thus trapping him in a remote canyon in Utah for 127 hours. Relying on his sheer will to live, he makes the decision to cut off his arm, so that he might survive the ordeal. As an audience viewer, we are stuck in the canyon right along with him from the very beginning of the film − even before the title frame rolls. It’s terrifying, thought provoking, life altering and undoubtedly hard to view at times. In the hands of Boyle, he lightens the material and brings us to places of joy, as flashbacks of Ralston’s life are a large aspect of the film. Parents, friends and family members become the focus. As a mom, these scenes blew me away. You can’t help but be moved. The film brought me to tears as the true terror of the loss of a loved one (especially in this situation) is almost unbearable.